Similar to her love for curly hair, it was a long and winding road that led Andy to her new salon home at Salon Next door. Ever since childhood, she wanted to be a hairstylist, but it didn’t come to pass until she accomplished a few other things first. She grew up in the San Francisco Bay Area, went to college and graduated from Syracuse University, and eventually moved down here to the Canton area to raise her family. Andy has worked hard on many accomplishments including her Bachelors degree in Accounting, as well as a career in radio in various markets around the country. Then one day, while attempting a Pinterest hairstyle on one of her daughters she was reminded of her love of hair. It was then that she made the move to start along that path. Andy studied Cosmetology at Paul Mitchell the School, Temecula, CA and is currently licensed in both CA and GA.
She went on to become a Deva Inspired stylist by taking class at the Deva Academy in Los Angeles. 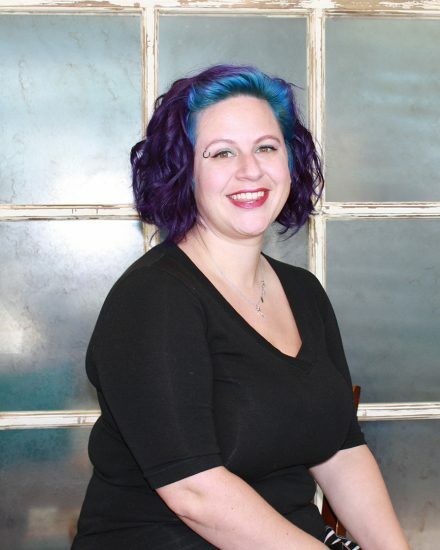 Andy’s passion for curls knows no bounds and she takes a special pride in educating her clients on how to work with and love their natural texture. She also keeps up with current color trends, especially when it comes to fun, funky colors.